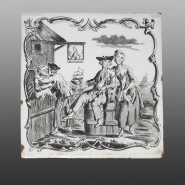 Shown here is a tin-glazed tile printed in the same The Sailor's Farewell design as used on the plate above. While not marked, which is sometimes the case, the engraver and printer is believed to be John Sadler of Liverpool. A molded creamware dinner plate. The central pattern, known as The Sailor's Farewell, includes a sign inscribed "King of Prussia" which hangs from the roof of the building on the left. A painted enamel inscription is found below the central pattern "JOHN & SARAH ARTIS, YARMOUTH, 1769". A possible attribution to Sadler as the printer has been suggested, given that this same pattern is known on an overglaze printed tile (see additional image below). There is an impressed mark on the back consisting of four closely-spaced, short lines.